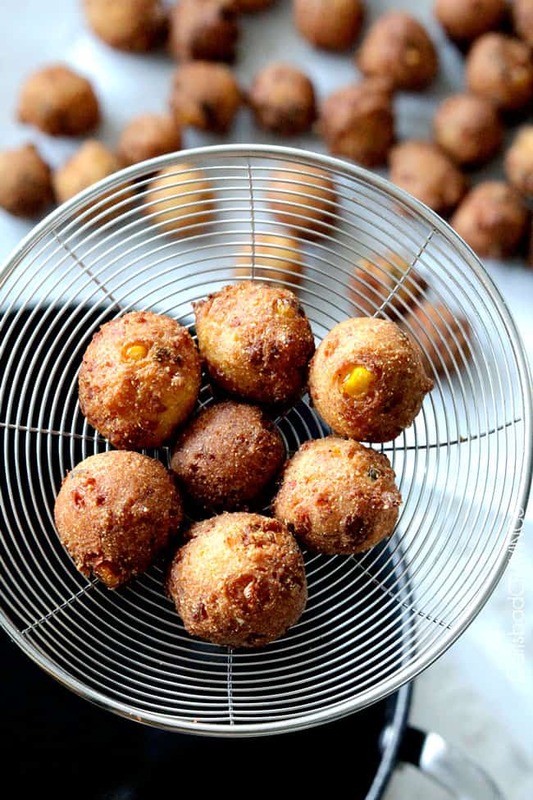 Hush Puppies are irresistible and SO easy to make at home! Hush Puppies with a crispy, golden outside and soft, cornbread inside infused with bacon, pepper Jack cheese dunked in the most tantalizing sweet and tangy Sweet Chili Dijon Sauce! Are you drooling yet? 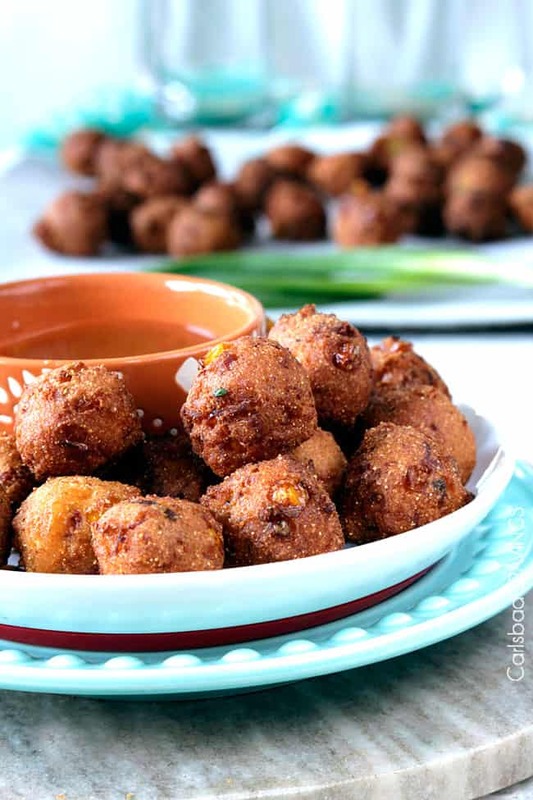 Hush Puppies are one of the most crave worthy morsels ever – AND this hush puppies recipe is one of the world’s easiest appetizers to make! You can make hush puppy batter ahead of time and refrigerate for easy assembly, or make and either refrigerate or freeze the hush puppies for an almost instant/snack appetizer at a cravings notice. I remember the very first time my teeth sunk into deep fried hush puppies. I was 11. It was summer vacation. Hawaii. Bubba Gumps. And paradise just got even more paradisiacal. 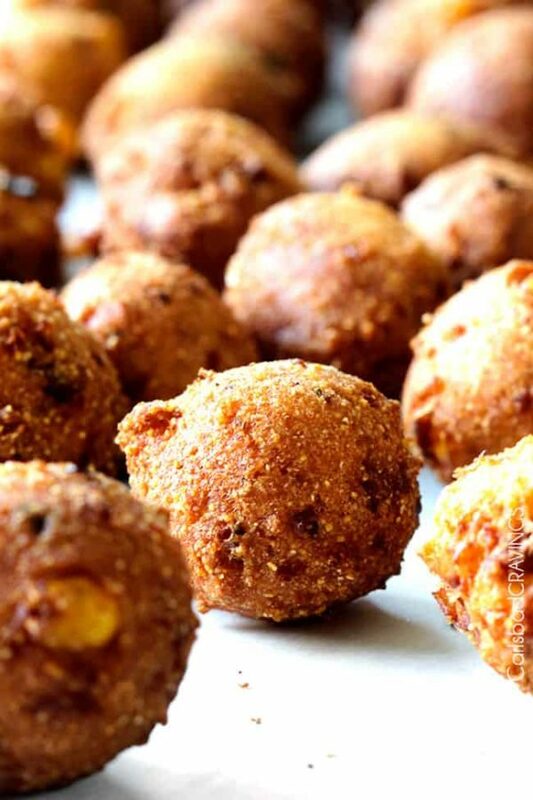 If you have never devoured hush puppies before, please end your deprivation right now starting with these Bacon Pepper Jack Hush puppies recipe! This hush puppies recipe is so easy to make and take less than 30 minutes start to finish (most of that time is just babysitting them as they fry). Good thing, because you will probably inhale them in less than 10 minutes and need a second batch. 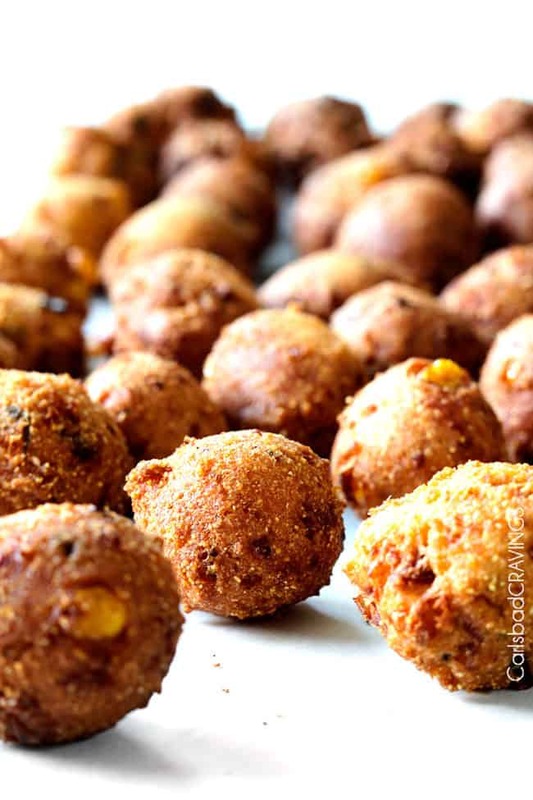 Hush puppies are little balls of deep-fried cornmeal, about the same size as a meatball or a scoop of raw cookie dough AKA deep fried cornbread balls with seasonings. As if cornbread wasn’t delicious enough?! HOW DID HUSH PUPPIES GET THEIR NAME? There are many different tales about how or when hush puppies came to be. My favorite version of the tales is the one attributed to hunters and trappers who would be on the trail for months at a time. When their hunting dogs got hungry at night, the hunters would cook a basic cornmeal mixture on the grease of the fire and feed it to the dogs to “hush the puppies.” Maybe that’s also where the term “lucky dogs” comes from. Whether you subscribe to the tales of Indians in Southern America, Civil War soldiers, southerners cooking at fish fry festivals, or cowboys out on the plains, the ingredients and how to cook this easy appetizer treat are pretty much the same in the end. WHAT ARE HUSH PUPPIES MADE OF? About a half dozen ingredients are in a hush puppies recipe. While there are some small variations (like onion powder instead of onion shavings, garlic powder, or even no onion at all), most people use cornmeal, wheat flour, baking powder, salt and milk or buttermilk as well as eggs. I, of course, add a punch of flavor with the addition of bacon and Pepper Jack cheese. I have used Pepper Jack in my last three recipes (hush puppies, Southwest Pepper Jack Salad Bacon Ranch Pepper Jack Pull Apart Bread), so I guess you now have three wonderfully delicious reasons to buy pepper Jack, starting with these incredibly easy, tasty hush puppies. And if you need one more reason: everyone gathered around your television in their matching football jerseys will love you for it! DO HUSH PUPPIES HAVE MEAT IN THEM? Traditional hush puppies do not have meat in them – remember the tales of how they came to be. 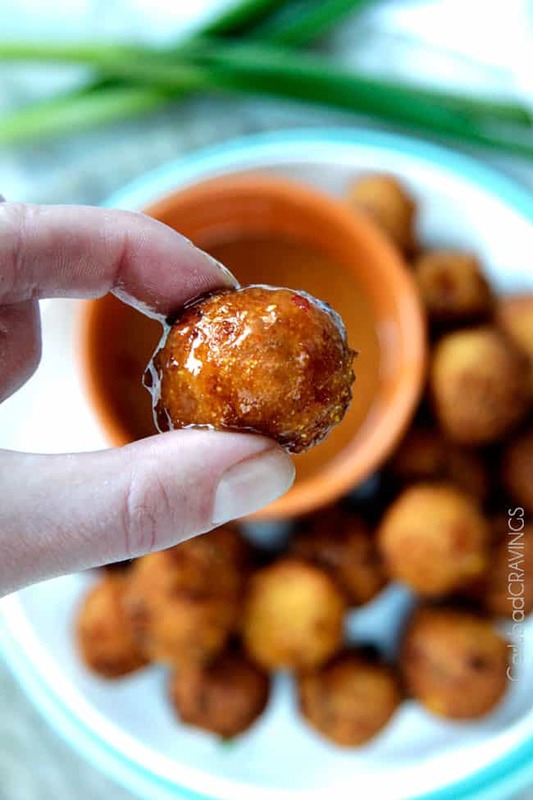 The best part about this hush puppy appetizer is how easy it is to throw together, how simple the ingredient list is, and how delicious they taste! Cornmeal, eggs, milk or buttermilk and a couple of other ingredients make this deep-fried dish complete. I add bacon to my hush puppy recipe, but this isn’t traditional and of course optional- but totally delicious! WHAT ARE LONG JOHN SILVER’S HUSH PUPPIES MADE OF? Long John Silver’s hush puppies, are perhaps the most well known, but I guarantee this hush puppy recipe is even MORE delicious! Pretty much the only thing that stands out in Long John Silver’s hush puppies is the addition of onion, minced or in powder form. I replace this onion with green onions, for their milder but still punchy flavor. HOW DOES PAULA DEEN MAKE HUSH PUPPIES? Paula Deen makes her hush puppies with onions, like Long John Silver’s. except that she uses chopped onion, not minced or powdered. In addition, Deen uses self-rising flour and self-rising cornmeal. She also uses buttermilk instead of regular milk, staying true to those southern roots! Self-rising flour: Self-rising flour is different from other generic flours in that it has salt and baking powder already added in and evenly distributed throughout. You do not need to add baking powder if you be using self-rising flour. Self-rising ingredients are typically used in southern cooking and are most easily found in grocery stores in the southeastern US. If you have self-rising anything, you don’t need to get out as many ingredients for your recipes, so you save time in the kitchen! How to make self rising flour: If you don’t have self-rising flour, you can easily make your own. Simply combine 1 ½ teaspoons of baking powder with ¼ teaspoon of salt for every cup of flour in your recipe. Do this ahead of time, then label and store it in an airtight container. Otherwise, you aren’t really saving any time! Self-rising cornmeal: Self-rising cornmeal is different from regular cornmeal in that it too already has baking powder and salt added in and evenly distributed. You will want to omit the baking powder and salt in th recipe if using self-rising cornmeal. Here’s something to watch for though, self-rising cornmeal is not the same as self-rising cornmeal mix. Self-rising cornmeal mix already has flour added into it! Is your mind spinning yet? How to make self-rising cornmeal: If you’re wondering whether or not you can make your own self-rising cornmeal, the answer is yes! Simply add 1 ½ teaspoons of baking powder and ½ teaspoon of salt to 1 cup of cornmeal and mix together. Again, make it ahead of time. Then store and label it in an airtight container until you’re ready to use it in your recipe. 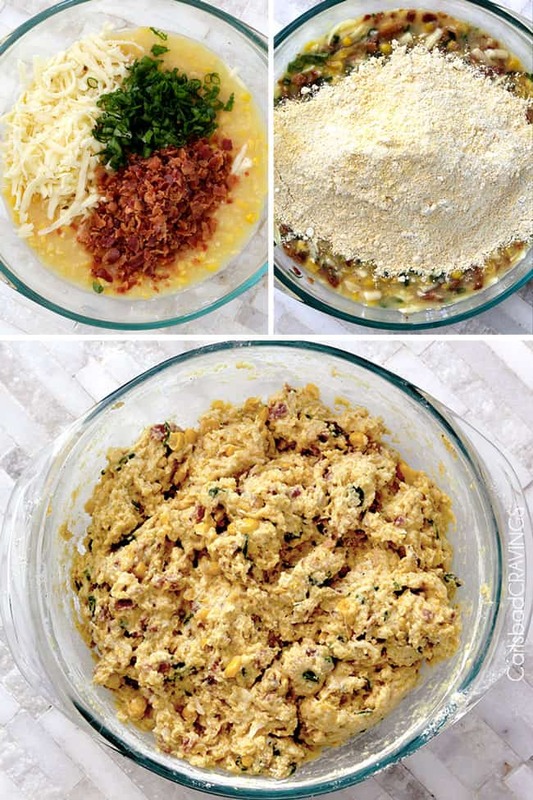 Step 1: To make, simply combine your “wet” ingredients – creamed corn, green onion, pepper jack cheese, sharp cheddar, bacon and eggs with your dry ingredients – cornmeal, flour, baking powder, sugar and some spices to form a batter. Step 2: Heat the oil in a large pot to 350 degrees F.
Step 3: Drop the batter by 1 1/2 teaspoons (they don’t need to be neat!) into hot oil to fry. Step 4: Transfer to a paper towel-lined plate. Can I Pan Fry Hush Puppies? Although pan frying will work for many fried foods such as chicken, it is not suitably to make hush puppies. Hush puppies need to be submerged completed in oil or the will fall apart and not cook evenly. If you aren’t familiar with frying, it is easy! Just fill your pot with oil high enough to cover the hush puppies and heat to 350 degrees. I highly recommend a thermometer to ensure you have the correct temperature. If your oil is to hot, then the hush puppies will cook on the outside but still be raw on the inside. If the oil is too cold, the hush puppies can fall apart. You can still fry without a thermometer, but it may be be more trial and error. If you are frying without a thermometer, make sure you pinch off some dough and add it to the pot. If it boils, your oil is ready. If it boils and turns dark within a minute or so, your oil is too hot. You will have to reduce the temperature, wait, and try again. Take care you don’t overcrowd your pot so the hush puppies can cook evenly and so you have plenty of room to flip the hush puppies over with tongs. Use tongs or a slotted spoon to transfer fried hush puppies to a paper towel lined baking sheet or serving platter so they stay crispy. You don’t want them sitting in oil. What oil is best for Frying? WHAT DO YOU DIP HUSH PUPPIES IN? Dunking the golden, crispy hush puppies into a stand-alone-delicious dip is one of the best parts! My favorite dip for hush puppies is my Sweet Chili Dijon Dip. It is made by whisking Asian Sweet Chili Sauce, Dijon mustard, honey and hot sauce. It is SO simple to make but results in sweet, tangy perfection. You will love it! I’m already concocting a chicken recipe based purely on this sauce – its that good. Other popular dipping sauces for hush puppies include tartar sauce, any variety of aioli you can dream up, honey dip, and remoulade. Can I make Hush Puppies Ahead of Time? Absolutely! You can either make and fry and simply reheat (instructions below), or you can make the batter, cover, and refrigerate for up to 24 hours. Refrigerated batter is even easier to work with. Hush puppies are best served warm. To keep your hush puppies warm after frying, transfer to a baking sheet and place in the oven preheated to the “warm” setting. HOW DO I STORE LEFTOVER HUSH PUPPIES? To refrigerate: Once your hush puppies have cooled to room temperature, place them in a zip bag or airtight container lined with paper towels. Consume within a few days. Can I freeze Homemade Hush Puppies? Space out evenly on a baking sheet and flash freeze by placing in the freezer until solid, about 1-2 hours. This prevents the hush puppies from freezing together. Place hush puppies in an airtight container or freezer bag, lined with paper towels. Label and store up to 3 months. CAN I REHEAT HOMEMADE HUSH PUPPIES? From frozen: place a few hush puppies at a time on a microwave-safe plate and heat for up to 1 minute to partially defrost. Transfer hush puppies to a baking sheet, evenly spaced, and place in a 400-degree oven for about 4-6 minutes. Watch them to make sure you don’t burn the tops! From the refrigerator: place hush puppies in a 400-degree oven for about 4-6 minutes. Again, just watch them to make sure you don’t burn your tops! What to Serve with Hush Puppies? 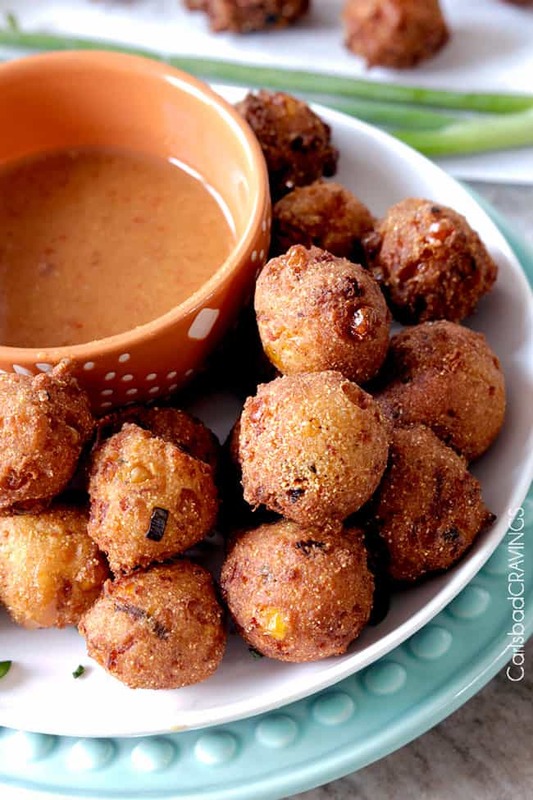 Want to try this Hush puppies Recipe? Pin it to your GAME DAY, APPETIZERS or DINNER BOARD to SAVE for later! Hush Puppies with a crispy, golden outside and soft, cornbread inside infused with bacon, pepper Jack cheese dunked in the most tantalizing sweet and tangy Sweet Chili Dijon Sauce! Hush Puppies are one of the most crave worthy morsels ever - AND they are one of the world's easiest appetizers to make! Whisk together Sweet Chili Dijon Sauce ingredients in a medium bowl and set aside. Heat oil to 350F degrees in a deep-fryer or Dutch oven. Drop batter by 1 1/2 teaspoons (or 1 heaping teaspoon) into the hot oil (it will be sticky!). Fry hushpuppies in batches for 2-3 minutes or until golden, flipping them about halfway through. Be careful not to overcrowd the pan while frying so you will have room to flip. Use tongs or a slotted spoon to transfer fried hushpuppies to a paper towel lined baking sheet or serving platter. Hush puppies are best served hot but still delicious room temperature. You can also reheat in the microwave for about 45 seconds. *I like to work with half of the mixture at time and keep the other half in the refrigerator until I'm ready for it because it is easier to handle when slightly chilled. You may also cover and refrigerate your dough up to 24 hours ahead of time. I think homemade hush puppies are best eaten fresh. however, they can be refrigerated and/or frozen. Once your hush puppies have cooled to room temperature, place them in a zip bag or airtight container lined with paper towels. Consume within a few days. Let hush puppies cool completely.